Donations are critical to the making of the film. All funds raised will be used to make this important film and in a more far reaching way, to help provide ongoing support for several key organizations involved in environmental conservation and educational projects. 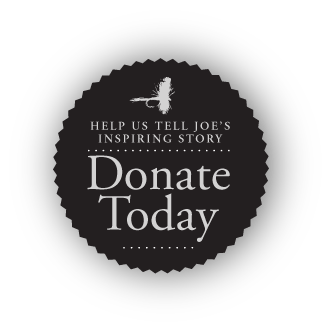 The Joe Brooks Foundation for Conservation and Outdoor Education, Inc is a 501(c)(3) nonprofit organization. Your contribution to this film is tax-deductible to the extent allowed by law. No goods or services were provided in exchange for your generous financial donation. To pay tribute to Joe Brooks and his generation of fishermen who had the passion, foresight and drive to popularize and expand the sport to vast new realms, pass down their knowledge to the next generation and begin the process of conservation of fish populations and water resources. To inspire others to have the same drive and passion in their pursuits and encourage them to give back in the same way that Joe Brooks and his peers did for the fly-fishing community. To support the efforts of non-profit organizations working in the world of fly-fishing to advance the sport, engage the next generation of fishermen and preserve fish populations and water resources. PayPal is one of the most secure online payment systems. Their protection policy protects you from fraud and provides advanced encryption protection. It is easy and can be as fast as 3 simple clicks. No wrangling addresses, numbers, expiry dates or codes. Stay in Touch Sign up for our email newsletter to get updates.